The official ESPN app (formerly known as SportsCenter, or was that Score Center?) looks largely the same following the update to version 4.2 as it did in 4.1, unless you're running it on an Android tablet. There the experience has expanded to present you with more information on-screen. Want to see the latest sports gossip news? You got it. Want to see scores at the same time? Sure. Information on your favorite teams is tucked away along the top-right corner of the action bar. This update also includes ESPN Now, the ability to swipe right from the news section to access photos, videos, and other content from social networks. 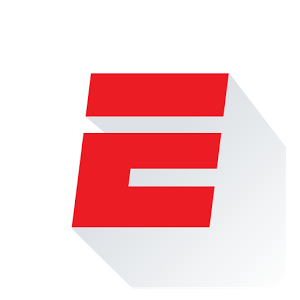 ESPN asserts that the app is faster than ever. Just like an athlete, stuffing it up apparently hasn't slowed it down. But, again, just like all televised sports, you'll be the judge of that. NEW: Speed, speed, speed. The app is faster than ever, looking a lot like LeBron charging into the playoffs. NEW: Support for tablet! 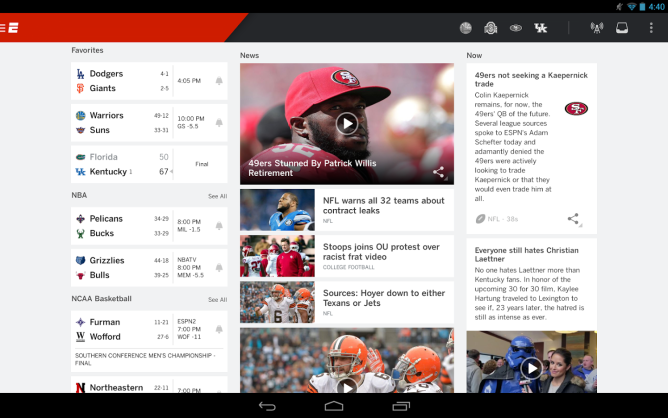 The app takes advantage of your tablet's gorgeous screen to show you scores and news at the same time. Your favorite teams are just one tap away. Simply find them in the upper right corner for quick access, or in the Mega Menu.